I like the new G.I. Joe vehicles. You like the new G.I. Joe vehicles. Everyone likes them, making them a bit hard to find in stores. 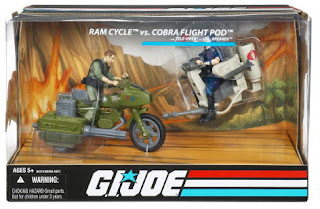 Wave 1 has been out for a few weeks, and I just now managed to lay my hands on a case fresh Cobra Trouble Bubble/G.I. Joe Ram motorcycle combo pack (pictured above) last night at Target just as they were stocking the shelves. But I still have yet to see the coveted HISS Tank on shelves anywhere. Meanwhile, Wave 2 is coming in October, to be followed by Wave 3 and its imposing awesomeness. 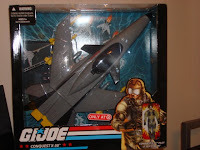 Highlights of Wave 2 include the Cobra Firebat and the G.I. Joe SHARC. Wave 3 includes the Cobra Fang & Claw combo pack and the G.I. Joe AWE Dunebuggy. 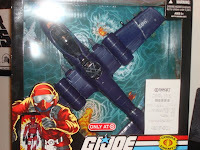 Also, the Target exclusive Cobra Rattler airplane has just been spotted in some stores. To get your hands on one of these babies, expect to battle Ebay scalpers, crazed Joe fans, and small children - possibly all at the same time. Update: Besides the Cobra Rattler, the G.I. Joe Conquest is also a Target exclusive that has just started to trickle into some stores. Both are pictured below. Update #2: Supposedly the ones above leaked onto shelves before they were supposed to. Officially they are to be released sometime during the first week of September.